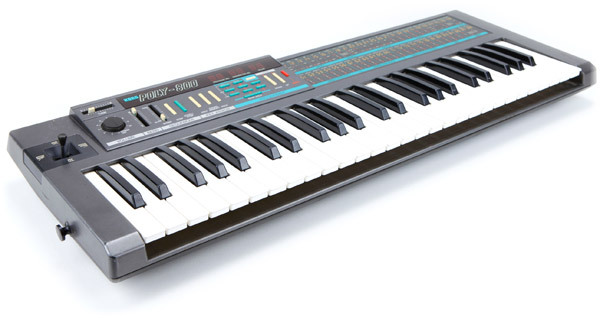 I just found a Korg Poly-800 synthesizer and boy are they going for real cheap nowadays. Perhaps there is a reason for that, but regardless I found it be a cool little retro synth from the 80’s. I actually think it sounds pretty good if you are into synthpop as pretty much anything goes in that synth genre. I haven’t had much time to work with it and currently I’m cleaning it up a bit, but so far everything works great. I also picked up the Korg Poly-800 patches online from AnalogAudio which really brings out the sound character of the synth. These analog synths are a bargain and I find them to be very fun to get creative with. If you see one, I highly recommend not passing it up for the prices they are going for. I just received notification that my new Boss RC-505 Loopstation was shipped. That means I’ll likely have it in my hands to check out tomorrow afternoon or maybe morning even. I’ve been quite excited about this release mainly because of the five tracks, loop effects, and table top design. I’m also excited to use this not for what it was intended, a beat box looper, but rather a synth looper. I currently own the Boss RC-300 and while it’s a very good looper, the Boss RC-505 has more features that I wished were on the RC-300. I have some questions though and I hope to answer them tomorrow when the Boss RC-505 arrives. 1. How much can I control the RC-505 with my feet? I am hoping I can start, stop, and overdub record with a foot pedal. Indeed I can do that with my hands, but there are some synth parts that might make this difficult. Having the option to start/stop/mute/continue would be fantastic. 2. Are the effects global or can I record or use the effects per loop track? I believe this is already answered in the demo videos and catalog, but I’d like to know for sure how flexible the effects are with looping. 3. MIDI! Oh yes! How well does the Boss RC-505 sync with a drum machine or the Boss RC-300. Likely the RC-505 has to be the master, but will a drum machine stay in sync? We’ll see. 4. Boss RC-505 Manual – It will be nice to also have a manual to check out all the possibilities. Boss seems to be a little slow in releasing the manual. Likely I’ll get a Japanese manual since I’m in Japan, but hopefully soon an English one will be posted. 5. Size! I’m very curious about how big the Boss RC-505 is and whether I’ll be able to set it on a synth instead of a table or dedicated stand. Those are basically the main questions I have. The five tracks is huge with the Boss RC-505. Although three was great, there is a lot you can do with five. Plus you can load or dump the tracks as WAV files for further editing in a DAW. The Boss RC-505 is going to be a lot of fun. I just hope it allows me to do a little bit more with my feet using external pedals. I’ll find out soon!! 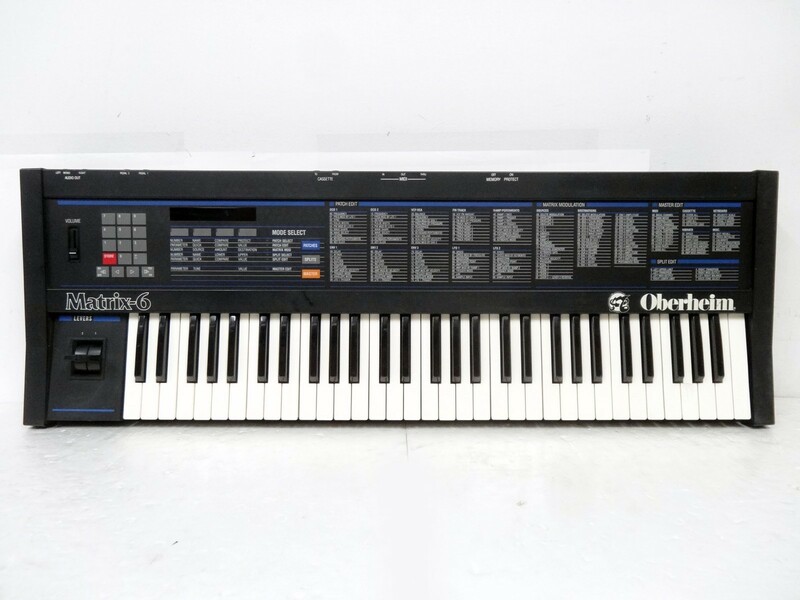 This week I scored an Oberheim Matrix 6 and Matrix 1000 combo in fantastic condition. I must say I LOVE LOVE LOVE this synth. The Matrix 6 is most definitely one my most favorite synths I’ve played no doubt. It’s important to note that I’m a big fan of the 80s, the decade I grew up in. When I browse through the patches I find so many that are useful for that 80’s retro sound. In case you didn’t know, the Matrix 1000 has just that…. 1000 patches inside. 800 are presets and the other 200 are user based. The Matrix 6 has 100 user patches. I use the OB6000 software editor to transfer patches to and from either the Matrix 6 or Matrix 1000 using a MacBook Air. Both the Matrix 6 and 1000 are in like new condition. The Matrix 6 is black and looks wicked. They were sold to the used shop together by the original owner in Japan and so I figured it was best to pick them both up while I could. The video attached below was a MAJOR reason why I bought them. I must admit I didn’t know much about the Oberheim Matrix series synths, but the video convinced me I needed them for that cool 80’s vibe. Modern stuff I suppose would also be quite easy to compose on the Matrix synths as well. The video is of the Matrix 1000, but it sounds pretty much identical to the Matrix 6. I haven’t used them both enough to notice any major difference, but I’m sure they exist. Now I am hoping these two synths just stay working over the next few years because they will definitely be front and center in my synth rig. They just sound great to my ears and they really ROCK when I’m jamming with them. At first I thought the Matrix 1000 would be redundant along with the Matrix 6, but I now find them to be quite useful together. The Matrix 1000 has so many patches it literally takes a couple of hours or more to audition them properly. I found myself checking the ones I liked and then dumping them over to the Matrix 6 for more tweaking. The Matrix 1000 also expands the Matrix 100 user patches by adding the 200 user patches it already has. The patches really are “so far” quite interchangeable. Another thing about the Matrix patches are that they really cover almost all the bases for any sort of 80’s synthpop band. Modern too! The Matrix 6 and Matrix 1000 are wonderful bread and butter 80’s synthesizers. I know I’m going to have a great summer jamming with these two guys. This week I found a Roland JX-8P in great cosmetic condition. I’ve always been interested in this synth because I’ve heard it’s been used on the a lot those Italo Disco records for strings and pads. After testing it out and playing through the presets and internal patches it’s not all that bad of a synth. I feel I need to do some programming a bit and scour the web for some better patches, but I know with the right ones, the Roland JX-8P is going to sound great. one problem I did find so far with my Roland JX-8P is the occurrence of a stuck note that happens completely at random. It also happens on different notes and not the same one. I’ve pretty much ruled out the idea that this is a dirty or problematic key due to the fact that it’s all completely random. ( Perhaps not so if some sort of diagnostic test could be run which I’m not aware of yet. I’m currently checking out the service manual ). I did find while search for similar problems a member on Gearslutz who reported the same issue. He fixed it by replacing a NEC D8253C-5 divider chip. I decided to investigate more about this. I opened up the Roland JX-8P and found four divider chips labeled NEC D8253C-2 and NOT NEC D8253C-5. Does the “2” and “5” make a difference? I’m not sure, but to be on the safe side I decided to order a set of NEC D8253C-2 chips off Ebay which are readily available for around $4.00 each. I also noticed that these chips appeared to be soldered. This is not a big problem, but it does mean a short soldering job is in store. Am I sure this will take care of the problem? No, but it’s a start and with one success story it’s as good a solution as any at the moment. Even with this sticky note problem, the Roland JX-8P is very playable and I found that if I could decipher the exact note right away, I could simply hit that note and it would go away. The stuck note is also mild and not “in your ear” blaring away! Hitting the note again did not make any sound rather it simply cut off the stuck note. The stuck note also happens very infrequently but enough to probably happen once or maybe twice during a song. For recording purposes, the stuck note is a non issue really. For live purposes this could be a problem if one is not paying attention. So I’m not completely worried about it unless it gets worse. For the price I paid, I expected a major issue. So far, I would say the NEC D8253C-2 chip problem is minor although I would love to find out which chip is the culprit rather than pulling all four. That’s 24 pins of soldering for each chip. I could test after each one and hope for the best and get lucky. We’ll see. Currently I have yet to get accepted to the Yahoo JX-8P groups which often has discussions about these sort of issues. The good news is that it’s not a huge problem and most likely fixable with NEC D8253C-2 chips. After my Roland Juno 106 experiences, I really don’t want to be bogged down again with chip issues again….laugh. I’m enjoying the Roland JX-8P. It was a nice find no doubt about it. I use the Midi Designer iPad app as a PG-800 controller. There is a brilliant Roland JX-8P editor in Midi Designer and it works awesome. Here’s a demo on Youtube of the Roland JX-8P in action from Jexus. Great stuff! Wow! I just snagged a Korg Karma Synth Workstation in near mint condition today for $160 bucks. There also was a JV-1000 Workstation available right next to it for the same price, but I decided to run with the Red Karma. I didn’t feel like digging into another laborious red epoxy cleanup job with the JV-1000 like I had to do with the one I already have. For those that don’t know, there is a terrible red epoxy issue with both the Roland JV-1000 and XP-80 keyboard workstation whereby the weights come unglued under the keys and drips all over the place. I actually bent over and examined under the JV-1000 and sure enough, the red epoxy was breaking up. I warned the “Hard Off” store sales staff, but they kind of gave me a deer in the headlight look…laugh. In any event, I’ve always wanted a Red Korg Karma and now it’s sitting pretty in my studio on the stand where I test new gear out. By the way, I do plan to post photos of my studio room as I’ve been getting quite a few emails about where I put all my gear since space is so limited in Japan. I’ll try to post some photos in an upcoming post this weekend. I’m a little mystified as to why the used music store was selling the Korg Karma for so cheap. There were no EXB boards inside and it wasn’t equipped with the MOSS board either, although I didn’t expect that. I removed the EXB-PCM04 (Dance Extreme) and EXB-PCM05 (Vintage Archives) from my Korg Triton Rack because I heard they were “Karmafied” and put them into the Karma. They make a nice addition to the Karma. I don’t have the EXB-PCM09 (Trance Attack) yet, but “may” pick that up. The Korg Karma only has two expansion slots though. I’m on the fence about the MOSS board. I’m not sold on it yet, but if I find a good deal I may acquire that. The Korg Karma is actually quite fun to play. There are a lot of combis that I’m not fond of, but overall there are some pretty good sets to work with. I may try to find a way to create my own custom bank to streamline things a bit, but for now it’s a really nice synth to jam with. I know there is software for this from Karmalabs, but I’m not sure about being tethered to a computer right now, BUT, you can create PCGs and GEs for storage in the Korg Karma, so that’s pretty cool. The Korg Karma Synth is unique and I do believe it’s quite different than my Korg Trinity and Triton. I know there are some similarities, but how one approaches the Karma Synth is likely to be different than the Triton. I also believe that Korg Karma could become a classic one day. It might already be one. I was extremely surprised to see one for sale in my neck of the woods because Korg is very popular in Japan and I’ve never seen a live Korg Karma before. Thus it goes without saying, I was pretty excited to find one especially in the near perfect condition it was in. As always, the original Japanese owner took really good care of it. Here’s a video found on Youtube that highlights exactly the stuff I like to do with the Korg Karma. Yesterday I took a gamble and bought a Yamaha QX-1 sequencer off Ebay for a decent price. I bought a Yamaha QX-3 about six months ago here in Japan and always wanted to have the Yamaha QX-1 as well. I really like these old school sequencers. As a kid growing up in the 80’s I could only drool over these in the music shop and now I can enjoy a little nostalgia and own them both. 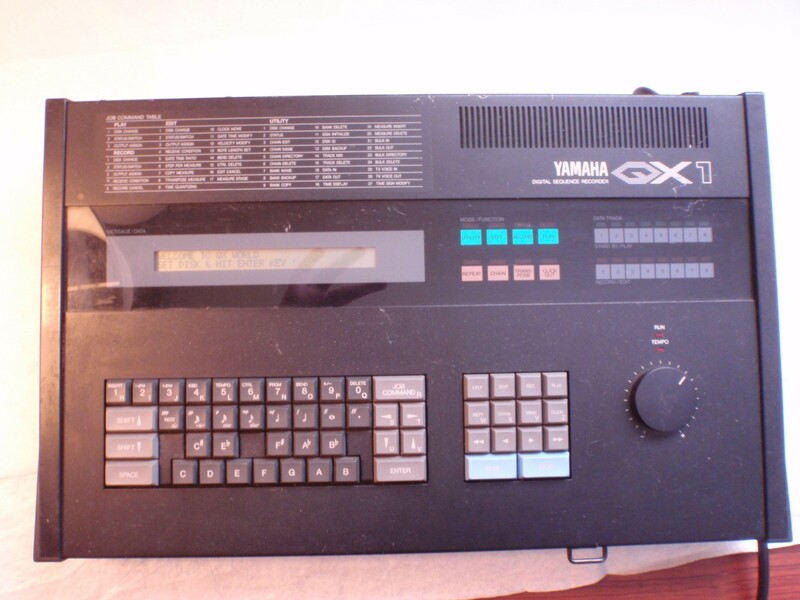 I don’t know a lot about the Yamaha QX-1, but it does have the 8 midi outputs coming out of the back, 8 polyphonic tracks, 80,000 notes, and an accurate clock resolution of 384 ppq (pulses per quarter note). It’s also a kind of a large sequencer and likely heavy. The one drawback is that it requires a working 5.25 floppy drive. I actually bought about 10 brand new boxes of 5.25 floppy disks about a year ago for under a dollar a box here in Japan. So I’m excited to have the media for it. By the way, the Yamaha QX-1 has been impossible to find in Japan lately which is why I elected to buy one off Ebay. Although the LCD and Power have been tested on the Yamaha QX-1, I am still awaiting delivery of the unit to test the floppy drive. There is a very high probability that the floppy drive will not work. Thus the I’m currently checking out my options for either a replacement drive OR an emulator of sorts to throw into the Yamaha QX-1. I did read about a replacement 3.25 drive, but cringed when I found out it was from Route66Studios which, sorry I’m not a big fan of. Living here in Japan I’ve had to deal with a lot of mail order companies over the past 20 years and Route66Studios ranks at the bottom in my experience, so I’m going to try and look for another way should I require a floppy drive replacement. Basically what I need to do is crack open the Yamaha QX-1 and inspect the factory drive and hardware controller. If I can learn more about it, I should be able to find out a suitable replacement for it. So my fingers are crossed that the drive components are not that ancient. Once I get the Yamaha QX-1 in the mail, I’ll update this post with some comments about the condition of the floppy drive. I’m just excited I get to “hopefully” use one of those new 5.25 foppy disks I bought recently. The last time I used a 5.25 floppy disk was back in University when I had to write a report using MS Word in the computer lab. That I believe was back in 1989 during my first year at the U of W! Wow! UPDATE: I managed to get the HxC Floppy Emulator connected and working with the Yamaha QX-1. I no longer use the floppy drive. The QX-1 runs silent, faster, and can hold as many floppies as you can store on an SD card. The Yamaha QX-1 is much more usable now and with 8 midi outs, it’s awesome!! HXCSDFE.CFG – HxC Yamaha QX-1 config file. Empty01.hfe – HxC Yamaha QX-1 formatted blank floppy. Here’s a new video of the Yamaha QX-1 attached to the HxC SD card floppy emulator. I made this really quick and will do a follow-up soon. Thanks!